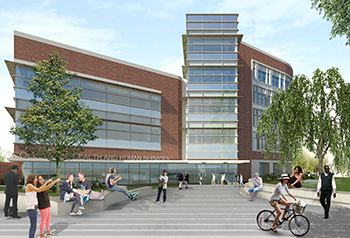 Description of the project: This 165,000 sf, $73 million, new construction project will provide much needed space to support new College of Health & Human Services programs and program expansion. The project is seeking LEED Silver certification. What services we are providing: HEA is providing commissioning services for all mechanical, electrical, plumbing lighting, fire alarm and building envelope systems. "We have been working closely with the design and construction team to review project submittals as they come in, and we are preparing for the installation and testing of an onsite mock-up which will be representative of the typical project conditions. We are hoping that the installation goes smoothly, and that we as a team can identify any improvements or potential deficiencies during the installation to minimize the risk to the University as they start to quickly install the exterior wall systems. We look forward to having an onsite presence throughout the project to help in the successful installation of all of the exterior wall systems."